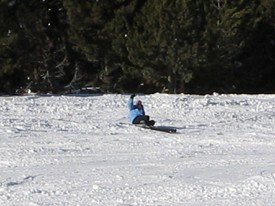 When we are not showing Dog's both of us like nothing better to take a few week's off on the slope's. If the Dog's can have a roll so can I! 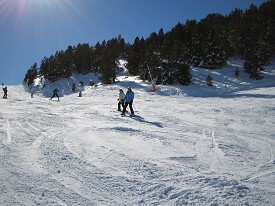 we can be found on the slope's in Austria,Andorra and Italy. My Friend Aly and me in action. My other great love is our horses.I have had my own pony since I was a child.My own horse 'Herbie' is now 26 year's old and going strong.He is a bay gelding and stand's 17'2' hand's high.I have had him since he was 5 year's old.We have had many successful year's together .He is a great all rounder and we have won lot's of Dressage,Show jumping and Cross Country competition's. It is very hard to show dog's and show horse's so 'Herbie' is very much my hobby and we enjoy a ramble around the mountain's about twice a week. 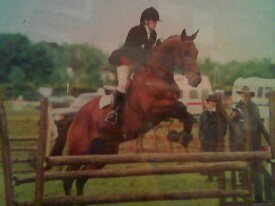 'Herbie' and I taking part in a working hunter class at Tattersall's '05.